People magazine is already in the tank for Donald Trump’s America. Is this a man who foments racist violence, or an American Idol winner? Donald Trump has barely had 36 hours to solidify the list of press outlets he’ll sue when he becomes president, and he’s already found a willing leader of his propaganda machine: People magazine. 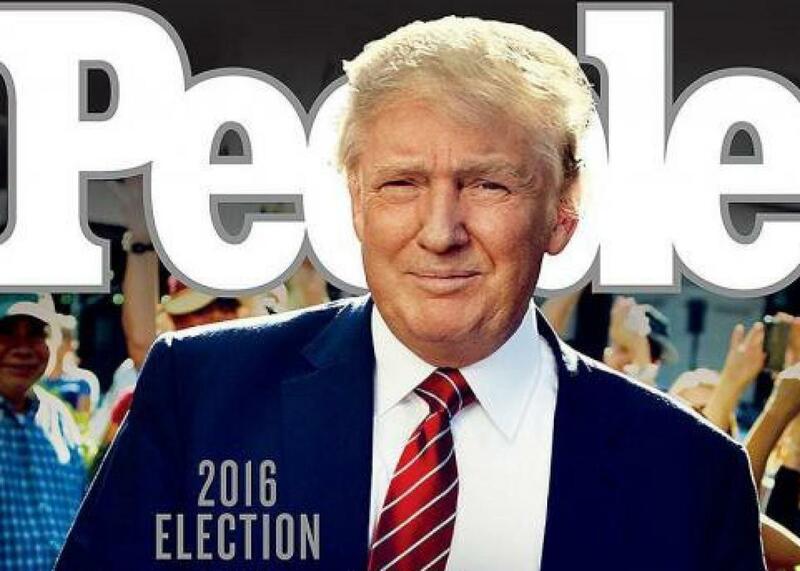 Now, People is giving Trump the idolatrous celebrity treatment with a cover image as gorgeous as anything aesthetically Trump-related could be. Backed by a crowd of enthusiastic fans and what looks like a farmer of color (a key Trump-supporting demographic), the photo makes Trump look warmer, more composed, and more normal than he’s looked in any photo, and certainly in any real-life encounter. The cover promises a look into “his life, his family, & his astonishing journey to the White House,” as if he were an unexpected American Idol winner, as if we haven’t already been scrutinizing his lifelong commitment to racism and misogyny, his disturbing relationship to his family members, and that violence-riddled journey for the past 18 months. Treating Trump’s rise like any other celebrity arc and not like an ominous sign of a resurgent white supremacist movement is an irresponsible move that should throw water on any suspicions that People might commit real journalism about his presidency. When People published Stoynoff’s story, it seemed brave and a heartening signal of a changing climate around sexual assault. When Stoynoff was assaulted by Trump, she wrote, she told her editor, but the magazine just quietly killed the story. With October’s essay, it seemed that People had turned a corner and decided it wouldn’t enable a sexual predator by keeping silent. That was a naïve assumption. People is a business, business depends on money, and People makes its money by floating along with the tide of mainstream public opinion. Money is why the magazine published Stoynoff’s account when it looked like everyone wanted to read about Trump’s alleged disgusting past, and money is why it’ll slobber all over him and his family now that tens of millions of Americans have endorsed him as our leader. Just hours after Trump was elected, People posted a collection of “way too cute” photos of Ivanka Trump, possibly the most important figure in his palatability efforts, and her family. Never mind that this week’s cover boy has said he’d never take his kids for walks or change their diapers, because that’s a woman’s job. He’s an adorable grandpa! “While it was politically expedient to stand by Stoynoff as she braved ad hominem attacks by Trump’s army of misogynistic supporters, People stood by her,” my Slate colleague L.V. Anderson wrote of the Ivanka piece on Wednesday. “Now that it is politically expedient to fawn over Trump and his family, People has thrown Stoynoff under the bus.” In the Trump era of harassment and hate crimes, journalists must decide whether they’ll keep their eyes open to the danger this man presents to the majority of American people, or shrug and accept his spiteful vision for the nation as the new norm. People has already picked a side.